Don't wait for things to happen, make them happen. The first thing you notice about her is her elegant, regal nature. Beautiful, eloquently soft-spoken and sophisticated, she definitely handles herself like a queen. In an industry where we barely see a representation of African-born talent, let alone many black filmmakers, Feyrouz Abdulrahman is starting to make waves in the Canadian film industry. Despite Canada being a multicultural country, and having a sizeable number of continental Africans, it is rare to see films with a continental African-born Canadian's perspective. 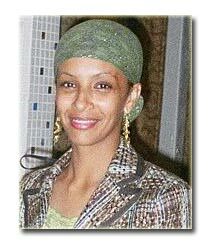 Abdulrahman, who is originally from the [Eastern] Horn of Africa herself, a country called Eritrea, challenges this with her debut independent documentary film - Mis Boon: Daughter of the Horn, which is a documentary about Eritrean experiences as told from an Eritrean Canadian perspective. Feyrouz Abdulrahman, who is an up-and-coming film producer, was born in Khartoum, Sudan in 1980 and immigrated to Canada at the age of seven where she studied business at York University in Toronto. She has always had a passion for film. And so her interest in the film and television industry began when she was still enrolled at York University. With Claire Prieto, a pioneer Black Canadian filmmaker as her mentor, it comes as no surprise that Abdulrahman would branch out into the film industry. Nor does her interesting multicultural perspective come as a surprise when one learns about her rich background, which includes having lived in several countries including Greece, Libya, and Sudan. After graduating from York University, where her interest in filmmaking had already been ignited, she got a gig on Sun TV, as segment producer/researcher for the show Echo, which profiled several successful African Canadians in various industries. It was not too long after that that she started working on the documentary Mis Boon: Daughter of the Horn. Feyrouz Abdulrahman is definitely a name to look out for. In recognition of World Refugee Day on June 20th, 2006 a non profit organization, Our Generation, screened the documentary Mis Boon: Daughter of the Horn at 6:00pm sharp at the Drake Hotel in Toronto. It was screened along with another short documentary entitled Invisible Children which looks at the plight of the children in Uganda. Mis Boon covered the experiences of a group of young Eritrean women who are either children of refugees or refugees themselves, as well as the history of Eritrea. Mis Boon is an informative piece with an intimate traditional feel. Flyer for screening of Mis Boon: Daughter of the Horn. I had a chance to catch up with Feyrouz and got her to tell me more about herself and her new documentary. Jane: Who is Feyrouz Abdulrahman? Where were you born? What is your heritage? Tell us a little about your childhood and how you were raised. 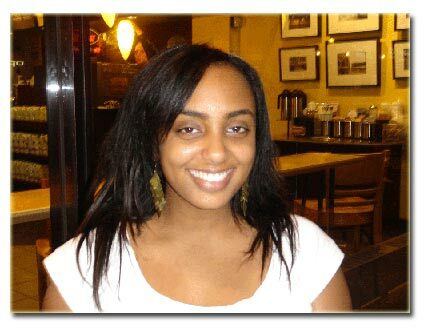 Feyrouz: I'm an Eritrean who has lived in Toronto for almost 20 years. As a young child I remember traveling quite a bit between the ages of 2 to 6. My parents fled the war in Eritrea and went to Sudan, where I was born. From there we went to Libya and then Greece for 4 yrs. I realize that this is not an uncommon story amongst Eritreans, as many had to rebuild their lives by seeking refuge in various places before settling somewhere they felt could offer their children opportunities and hence many of us are now living in North America. When my family got here of course, my parents wouldn't let my brothers, my sister and I forget about the opportunities that we had at our disposal. So I've always been inspired by the differences in the realities of my parents and the realities of us growing up in Toronto. Are you still the segment producer/researcher for Echo, the show on Sun TV? No, that production has actually wrapped, although the show will be airing for about another year or so. The great thing about working on that television production was that I was able to work on things from various angles, which is very rare to say the least. I started the show as a production assistant and had the opportunity to produce a segment, research, then became the office coordinator. This exposure really gave me the confidence to do my own work because I realized that I could handle the job on various levels. Sometimes experience and exposure is the best way to continue learning and I was also fortunate enough to have been working with my mentor Claire Prieto. You must be excited about the screening of the film Mis Boon: Daughter of the Horn. Why did you come up with the name Mis Boon: Daughter of the Horn? What does it mean to you? "Mis Boon" literally means "Over Coffee" when translated from Tigrinya, the language which I speak, which is one of the languages of Eritrea. The short documentary is about the Eritrean experiences as told by a small group of Eritrean Canadian women having the traditional coffee. To me it's a traditional way that stories and experiences are shared in the Eritrean culture and growing up I remember my parents going through various stories in such settings. So I realized that it was a great way to introduce people to this culture and have them learn from it the traditional way. Moya Petros Teklue, one of the young women who was featured in the documentary. You mentioned that Mis Boon: Daughter of the Horn is a short documentary about Eritreans, which touches on the main events of your history. How large is the Eritrean Canadian population in Canada? The Eritrean numbers are growing within Canada, currently the numbers are somewhere between 15,000-20,000, with half of that population living in Toronto (between 8,000 -10,000). One of the scenes in the film was when several people were interviewed and asked if they knew where Eritrea was. Most did not know. How often do you come across people who do not know where Eritrea is? Pretty often actually, outside of the people I choose to surround myself with, people are still very unfamiliar with the country and it surprises me sometimes. I understand that. I went through that as a kid. I would say I was from Uganda and people would ask where that was. It was very frustrating. I understand that Mis Boon: Daughter of the Horn is an independent film. How did you handle all the costs incurred before, during and after production? I find that waiting for funding sometimes prevents you from moving at the pace that you would like, but of course it was not easy having this documentary as an independent production. The costs incurred from beginning to end really came out of my own pocket. It became nearly impossible at one point so we held a fundraiser at a restaurant on the Danforth (Cottage Lounge) which was quite successful. I also had help from a few organizations at York University including the Eritrean Students Association who were also very supportive and helped by donating some funds to this documentary; I really appreciate all the help I have received from my community. What led you to partner with the Ugandan Invisible Children filmmakers to have your films screened together at the Drake Hotel? in Washington DC, April 29, 2006. The organization that screened the documentary is a non-profit organization which seeks to bring awareness to international refugee issues. For this reason, they held the event on World Refugee Day and they actually chose both the Invisible Children as well as Mis Boon: Daughters of the Horn. Personally I liked the mission behind the event and having watched Invisible Children, I realize that this can only be a beginning. Since there is so much that needs to happen but if people are not aware of the situations in these parts of the world or even the existence of places in these parts of the world then nothing can be done. When did your interest in television and filmmaking start? My interest in the film and television industry really started as I was completing university and trying out different fields. I took business at the university and I was applying much of that to the offices at various film festivals and the more exposure I got the more I enjoyed what it had to offer. How would you define your style of filmmaking? Right now it's more of a documentary form of communication that I enjoy. Whether it's about a type of people, culture or just day-to-day matters from my perspective. In your documentary, several Eritrean girls were discussing their experiences either as children of refugees or as former refugees themselves. A lot of people, who are now settled in the Diaspora as immigrants and former refugees can identify. What made you come up with the concept? This concept is not surprising within our communities; it is the reality of most Eritreans living in Canada. The documentary addresses both the generation of Eritreans who escaped the war as well as the children of these refugees, as the children often share the same type of experiences and are dealing with a different sort of struggle than their parents. They also discussed the differences between them as Eritrean Canadians and their Eritrean parents, something again that many immigrants and former refugees can identify with. Was that a conscious direction you wanted to take the documentary into? It was inevitable and yes I was hoping to share this type of reality which happens to be my own as well with the general public. I say that it was inevitable because the documentary was from a Canadian Eritrean perspective and so you really get a sense of how different some of the issues facing them today are from their parents. It was a way to connect the past of Eritreans with the present and realize the effects that our history ultimately has in shaping our identities. 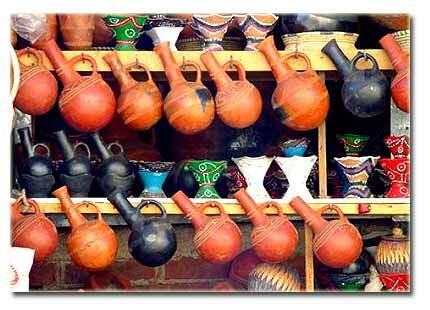 It was a very educative film, because it gave the viewers some history about Eritrea. Where did you get the clips for the historic parts of the documentary? The pictures were from various locations that were kind enough to share their resources for the film, including The Eritrean Cultural Centre of Toronto, Eritrea In Picture (www.erey.50megs.com), Boris Kester (www.traveladventures.org), and Eric Lafforgue (www.flickr.com/photos/mytripsmypics/). Although the film has been an idea for some time, the production of the film only took about six month due to financial limitations. Where can people who want to buy the film and offer you support reach you? I am currently in the process of getting a website set up but until then I can be reached at Misboon@rogers.com if anyone would like to offer support or get a copy of the film on DVD. When I attended the screening last Tuesday, there were so many people that some had to stand. Are you planning to have another screening for those who may not have seen the film? Yes, the debut screening was amazing and the feedback was also great. I have been in touch with a few organizers who would like to screen the film again so we are still in the process of discussing the times and dates... but it is something to look out for in the near future. Did you expect to see so many supporters? Since I was getting so much positive feedback for the documentary and the event itself I was hoping that the numbers would be high but it was really great to see the outcome in the end. I know that the Eritrean community is not used to going to many screening events and seeing images of their own people in films and the reaction to the film sort of confirmed that, because there seemed to be a sense of pride in finally being able to directly relate and identify. It was also great to see many other African Canadians from other communities. I know for example that there was a considerable number of Ugandans there. As an Eritrean Canadian how do you hope to contribute to the Canadian television and filmmaking scene? I would like to provide another perspective and by doing so maybe I will bring some insight to under-represented communities or individuals. I think that one of the things that the Canadian film and television scene is missing is a true understanding of minority communities and the people who are behind the making of these films. I think it is very important for people of different minority communities to create their own arenas to discuss their own issues. We see a considerable number of West Indian Canadians in the Canadian entertainment scene, but with the exception of people like Namugenyi Kiwanuka, K'naan, Zaki Ibrahim, Weyni Mengesha, and upcoming Joan M. Kivanda, not too many continental African Canadians are represented. Why do you think that is the case? K'Naan is now a celebrity. 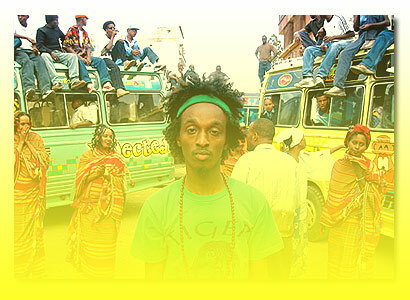 Listen to K'Naan videos here. I think that there are probably a number of reasons for this. With Eritreans for example, I know that many of us come to Canada in hopes of a better life and opportunity. From a young age, the disciplines we were encouraged to follow were the ones that brought the most stability in every respect such as medicine, law, and engineering or computer science. So basically pursuing a career in film is almost seen as a luxury, something that you might consider after you've achieved a level of stability for your family or community. My parents, I find their stories very inspiring. What is next for you? What kind of legacy do you see yourself leaving behind? I don't completely know yet, I think time will have to tell. I'd like to continue to pursue things that have meaning to me. I would unquestionably like to continue producing, maybe a small number of more short films and work my way towards the production of feature films as well. I look forward to your next project! She is the recipient of numerous awards for her poetry, art and playwriting and is becoming a household name in Toronto circles. Please visit her website at www.nteyafas.com.